Glass man to Ironman: Swimming analysis and wet suit! After suffering long enough i decided to get my stroke looked at and see where im going wrong, an after viewing myself on cam i can see why! I really look like im struggling...so now the coach is going to give me some pointers and where i should be working on, i would upload the video but due to other people in shot underwater i cant without their permission, i was due to do it in an empty pool but thanks to Lincolnshire county council blocking the road of for repairs i was 30mins late to the pool, but im just glad i got it done :-). 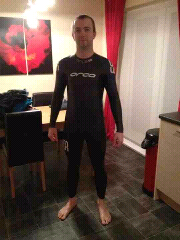 Also i now own a wetsuit! See the pic below, feels a tad tight so going to loose a few lbs an see if that helps, if not ill have to get another.